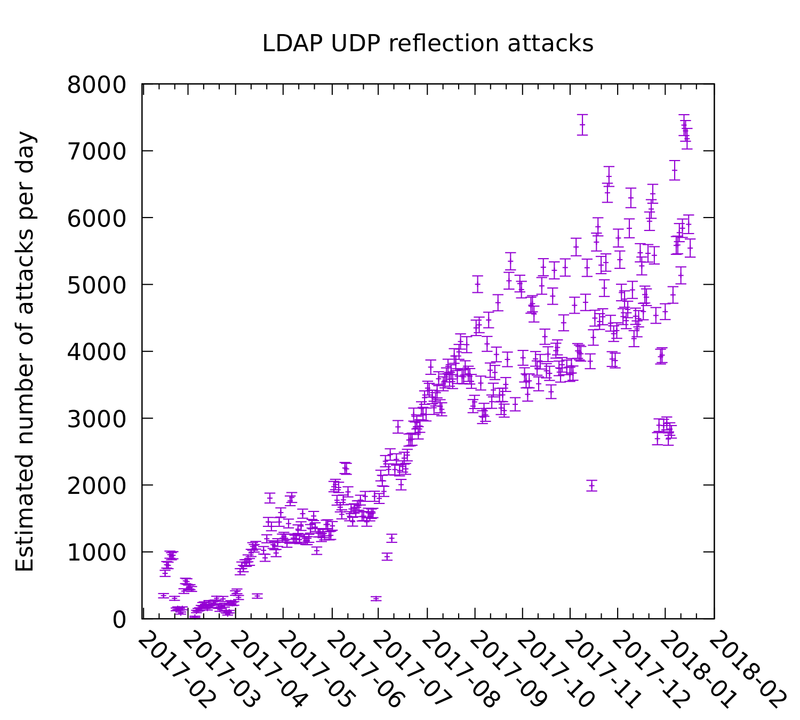 There have been reports that UDP reflection DDoS attacks based on LDAP (aka CLDAP) have been increasing in recent months. Our network of UDP honeypots (described previously) confirms that this is the case. We estimate there are around 6000 attacks per day using this method. Our estimated number of attacks has risen fairly linearly from almost none at the beginning of 2017 to 5000-7000 per day at the beginning of 2018. Over the period where Netlab observed 304,146 attacks (365 days up to 2017-11-01) we observed 596,534 attacks. This may be due to detecting smaller attacks or overcounting due to attacks on IP prefixes. The data behind this analysis is part of the Cambridge Cybercrime Centre’s catalogue of data available to academic researchers.